Zero to Hero - Tim did us proud! New Rider Training Courses £28! CBT Training: From 16 years of age. A1: From 17 years of age. Zero to Hero – Tim did us proud! 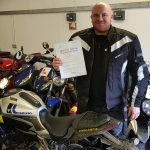 Another Easter treat for Tim Rayner of Horley, a true “ZERO TO HERO” going from a complete novice, CBT through to DAS pass first time both module 1 and 2 – wow well done Tim and just ready for the Spring savings in all the Sussex and Surrey bike shops indeed!!! Thanks for all your help Matt, really appreciate all your guidance, once I’ve got myself 2 wheels I’ll pop by and say hello. Your full motorbike licence instruction will be from our site in Burgess Hill, where all the test routes run. Weekday and weekend CBT courses are held at Crawley East Grinstead and Burgess Hill. Not sure how much tuition you need to pass your test? Book a free assessment and we’ll quote you for only the instruction you need. Want to buy motorcycle lessons for someone? Why not give them a Gift Voucher?